Short prints are nothing new when it comes to set-building products. They're business as usual for a lot of products. 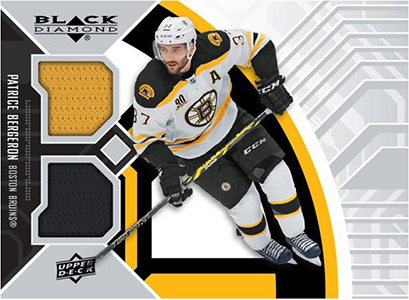 However, 2014-15 Upper Deck Black Diamond Hockey sticks with a configuration that is different from most products today. With four tiers of base cards, none of which involve autographs or memorabilia, this is one of the most challenging sets to take on that's actually directly aimed at that crowd. 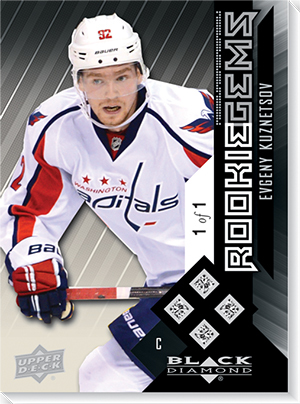 Other high-end sets might have smaller print runs, but they're more about the hits than finishing off the checklist. 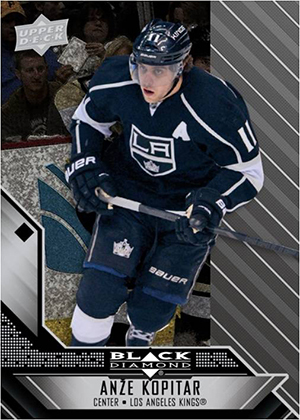 2014-15 Upper Deck Black Diamond Hockey divides its base set into Single, Double, Triple and Quad Diamond levels. The fewer the diamonds, the more common the card. At the same time, finishing the set is attainable. Double Diamond cards land six per hobby box. When it comes to Triple Diamond cards, collectors will find three rookies and three veterans per box. Quad Diamonds are three per hobby box, at least one of which is a rookie. The etched foil design makes for some bright parallels. These include Star Rubies, which are done with Light F/X technology this year, Emerald and Sapphire. The product also has autographed parallels. 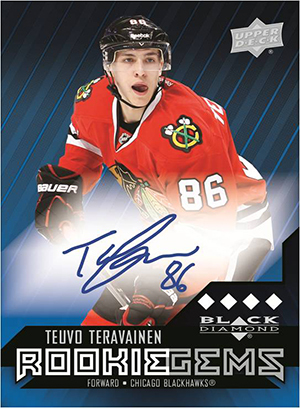 While the base set is the primary focus of 2014-15 Upper Deck Black Diamond Hockey, there are some hits. Hobby boxes have a pair of Double Diamond Dual-Swatch Jersey cards. While these work on their own, they also can be pieced together to form larger puzzles. Besides autograph parallels, Gemography cards return. Signature cards combine to land approximately four per hobby case. Acetate Hardware Heroes and die-cut Championship Rings both return as premium inserts. Hardware Heroes are a case hit and come numbered to 100. Championship Rings fall approximately four per case. 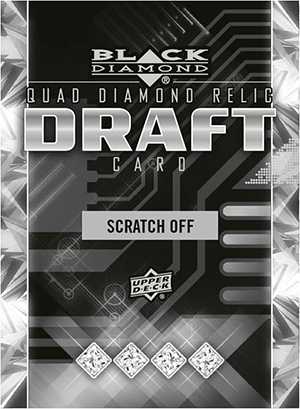 After debuting last year, the Quad Diamond Relic Draft returns. Redemptions, which are randomly inserted in packs, give collectors an entry into the interactive draft where they'll get to pick a one-of-one rookie. These special cards come embedded with four canary diamonds. Images shown are mock-ups. Designs and product content are subject to change. 100 cards. Shop for base sets (100 cards) on eBay. Serial Numbered #/10 or as noted. Some cards are signed and are noted as AU. Serial Numbered 1/1 or as noted. Some cards are signed and are noted as AU. Same exact stuff as… how many years in a row now? 10? Black Diamond is probably the worst product released by Upper Deck. Year after year you get the same dull cards. Have never broke even cracking boxes. Upper Deck should release it in August and with at least 8 cards per pack. 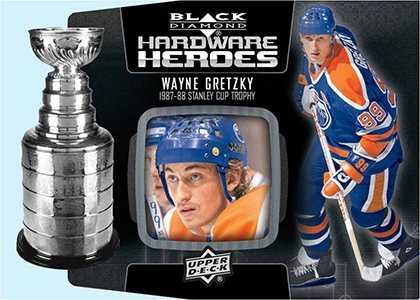 Releasing O-Pee-Chee and Upper Deck series one ahead of Black Diamond doesn’t help matters either. Hope I will be proven wrong when it comes out next Month. Daniel � Hi Daniel, We have been looking at alternative options for a while now. That being said, we think it’s important that collectors have a voice in what they like or don’t like about a product — even if it’s not out yet. We do try to watch for people who just say they hate, loathe or love something without giving reasons. We also look out for the same person trying to leave multiple reviews for a product under a different name (yes, it happens). never bought this . However, are the diamonds real? 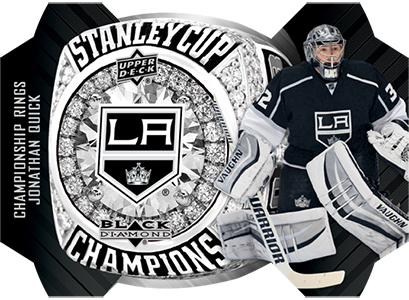 Luc � The only diamonds are in the special rookie redemptions. i agree with CJ. Its the same every year. boring. Not worth it. over priced and horrible odds of getting a good pull. And where are the MN Wild players. We get no credit. Dwayne Roloson??? come up with a few new inserts. Probably the best cards you can possible get ever!!! LOL! Just did a case break with the penguins and Toronto.. got a Phil Kessel #/10 auto and like 4 or 5 jersey cards..
Young Guns are iffy and no pittsburgh young guns makes me mad. idk why Gibbions is still considered pittsburgh??? Cards look great.. It is consistently the same (black diamond) but I will buy a box.. did the case break for pittsburgh cards before I buy a box..
Just finished breaking a case @ $1300.00. No big hits but thats to be expected. Been breaking a case every yr for about the last 6-7 yrs hoping to hit something big. I put the set together every yr, that’s why the case. Always fall about 20 quads short from the case which isn’t that great for the money. Kept giving it another chance but this year may be the last for me.Money will be better spent on other products with better chance of some real hits. Okay product. Broke a box yesterday and pulled 2 marginal jersey cards, marginal quad diamond rookie, 2 decent quad diamond legends (Bourque, Yzerman), and 2 parallels (Dustin Brown ruby and Jay Boumeester Emerald non auto /10). Liked the Oilers triple diamond cards, though but that’s just me. Orange pack yielded a single (Plekanec), double (Loungo), triple rookie (Mirco Mueller). Overall the money spent on the box was a little high for the return but not terrible. Watch those orange cards, the edges are not the greatest. I like the Emerald auto #/10 and the new orange. I will buy a few single for the PC and that’s it. I agree with everyone, the initial design of Black Diamond was nice, and the quand diamond All Star retired and current star players are always good looking and have a nice design, but it gets old after so many years of the same formula! This is my second review of this product but I have to give credit where it’s due. After buying 5 more boxes of this stuff at a lower price point, I am beyond impressed. Generally I see 2 parallels per box, one Ruby and one Emerald but three boxes yielded something special. 1 came with a group B gemography Ron Francis (probably the most underrated player of all time), another had a gold dual jersey Auto Phil Kessel /5 and the massive hit was a 09-10 Pride of a Nation dual on card autos of Carey Price and Steve Mason with a manufactured Canada patch. I also love the Orange cards. I have a small collection of the rookies but I did see somewhere that the Luongo and Crawford Orange cards are limited to 35 copies a piece. I have 2 of each! A small QC issue? Eh. Not going to complain.